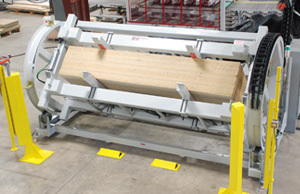 Bunk Turnover Machinery from Creative Automation provides Material Handling Solutions to the Wood and Related Industries – Creative Automation, Inc.
Below are examples of some of the bunk turnover options available from Creative Automation. Stand-alone bunk turnover in our facility prior to installation at the customer's plant. 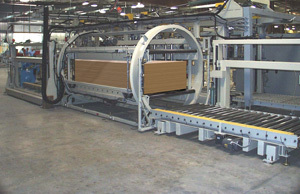 In-line barrel turnover automatically inverts whole stacks in a print line operation so that the second side of the panels can be printed. 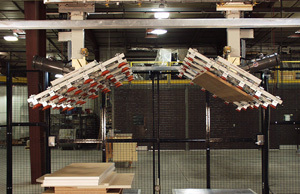 This turnover system will invert irregular stacks of panels with no setup.